Charles I (1625-49) Scottish silver twenty pence coin, third coinage 1637-1642. Obverse description: Left facing bust. X to the right of the bust. 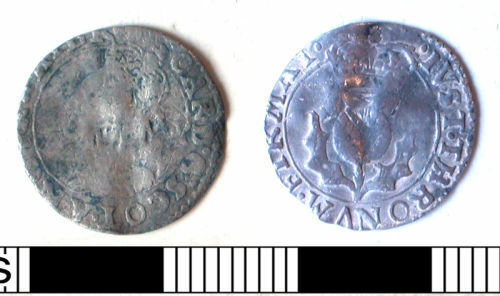 Silver, Scottish twenty pence, Charles I (1625-1649), third coinage (1637-1642). Pierced twice from front to reverse. A Scottish silver twenty pence of Charles I (1625-1649). Third Coinage, 1637-1642 (Spink 2003, 84).